ANNAPOLIS, Md. 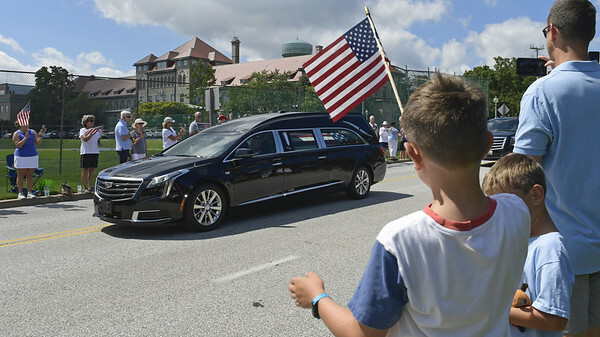 - Sen. John McCain’s final journey ended Sunday on a grassy hill at the U.S. Naval Academy within view of the Severn River and earshot of midshipmen present and future, and alongside a lifelong friend. Tributes to McCain began Wednesday in Arizona and continued for the remainder of the week. On Saturday, speeches by his daughter Meghan and two former presidents - Republican George W. Bush and Democrat Barack Obama - remembered McCain as a patriot who could bridge painful rivalries. While their remarks made clear their admiration for him, they also represented a repudiation of President Donald Trump’s brand of tough-talking, divisive politics. Trump and McCain were at odds during the 2016 campaign and for much of Trump’s presidency. Posted in New Britain Herald, Nation-World on Sunday, 2 September 2018 20:53. Updated: Sunday, 2 September 2018 20:55.